I just found out that another family member is pregnant and I was thinking of an Alice in Wonderland theme for the shower. Some ideas I had in mind were Jumbo Playing cards hanging from the ceiling and everything either backwards or upside down. I want it to be a silly, laid back event where everyone has a good time, but I don't want to make it feel like a 5 year old's birthday party. Please help! When I think of Alice In Wonderland, I think of a mad hatter tea party. On the walls, you can put signs that point around the room "this way" "that way" "wrong way", you can even put signs over the food table and gift table. Some great colors to match the movie are red, blue, black and white. You can bring those colors in with balloons and streamers. You can also pick up some themed invitations and party ware at Ebay . A fun tea party begins with tea! Create different kinds of hot and cold teas and lemonades for your guests to enjoy. Serve them with scones, muffins, fresh fruit, mini sandwiches and of course desserts. It would also be fun to have some teapot shaped cookies that say "eat me". Decorate your tables with pastel colors like in the movie. 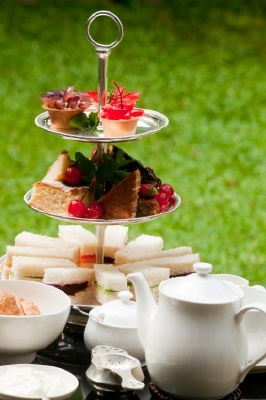 Use tea cups, fresh flowers, tulle, silver ware and trays to give it a fun tea party look. Scatter a deck of cards here and there to represent the Queen's guards. My favorite part of a mad hatter tea party is a mad hatter cake (also known as a topsy-turvy cake.) Click above for instructions on making one. If that looks a little hard for you, you can opt for a much simpler design, like a teapot shaped cake or a cake decorated like a playing card. Play the I never game- Have everyone sit in a circle. Have one less chair than the amount of people. One person starts in the middle and says something that they have never done before. If anyone in the circle has also not done that thing before, they have to get up and change seats. The person who does not have a seat is the next person to stand in the middle. Bloomers Shower Game- Play a gag game for your ice breaker activity. A box is passed around while music plays. For this game the guests are told there are bloomers in the box. Let them know that the person who ends up with the box when the music stops will have to wear the bloomers for the rest of the shower. When the music stops, the person who opens the box finds flowers attached to a safety pin in corsage fashion. Handbag Bingo- Give every guest a blank bingo card that says bingo in the middle. To get the bingo words, they need to remove items from their purse. Some items they might have in their purse are pen, lipstick, comb, gum, penny, paper, speeding ticket (if they were in a hurry to get to the baby shower ;) ), etc. Then you would read off a list of items, the first person to fill a line calls out bingo and wins a prize. mini teapot timers that say a baby is brewing.